I thought I'd start posting some old mani's so I know where they are. Just in case the worst should happen and I lose my photos offline. One of my all time favourite techniques is a sponged gradient. Not only is it reminiscent of my school days with potato stamping, but I usually find the huge clean up quite therapeutic as you unveil the end result. I must admit, I do prefer the high contrast gradients to the subtle ones. Nothing like an eye catcher! For this one I used 2 Rimmel London polishes, Pink Punch & Azure. 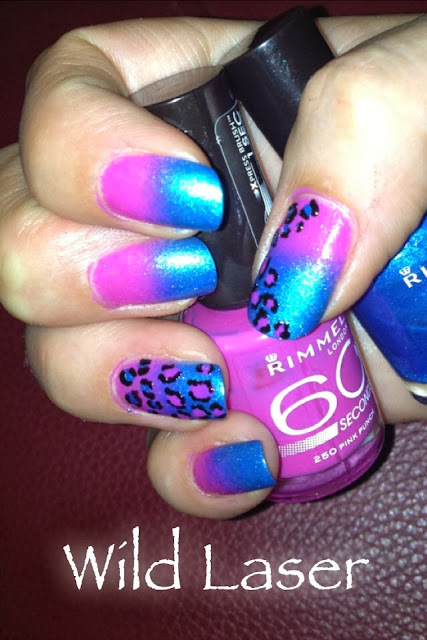 I then reversed the colours for the little leopard print on the accent nails. I really enjoyed this one and was sad to see it go.